Found this today. I can’t find any info about it. Has Channel 8 and Indianapolis, Indiana on the bottom. Thanks for looking! How about Charles M. Schulz,s *SNOOPY* ? Checked out The Coasters, *Charlie Brown* for a tenuous link, but No Dice apparently… . Mick. My first thought was ’50s-’60s local TV kiddie show host. Those I remember all had job-based characters: cowboy marshal, mayor, astronaut, deep sea diver, riverboat captain, and a Seadog would fit right in. But what does the block say at the top? Call letters? Well, that doesn’t quite fit either. KOG wouldn’t refer to Indianapolis broadcasting, or it’d start with a W. Maybe it refers to an actual vessel. Could “KOG 2389” be a marine vessel radio call sign and Channel 8 be the Marine Band Frequency to contact “The Seadog” on when in Indy? 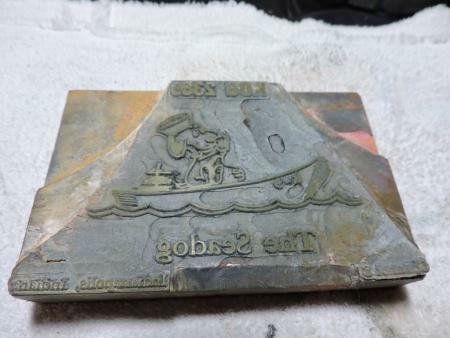 Assuming the size is about 3” x 5” it is probably an engraving for printing a CB radio QSL card. That was common about 40+ years ago. Here is some information on QSL cards. Thanks. That was a nice read.